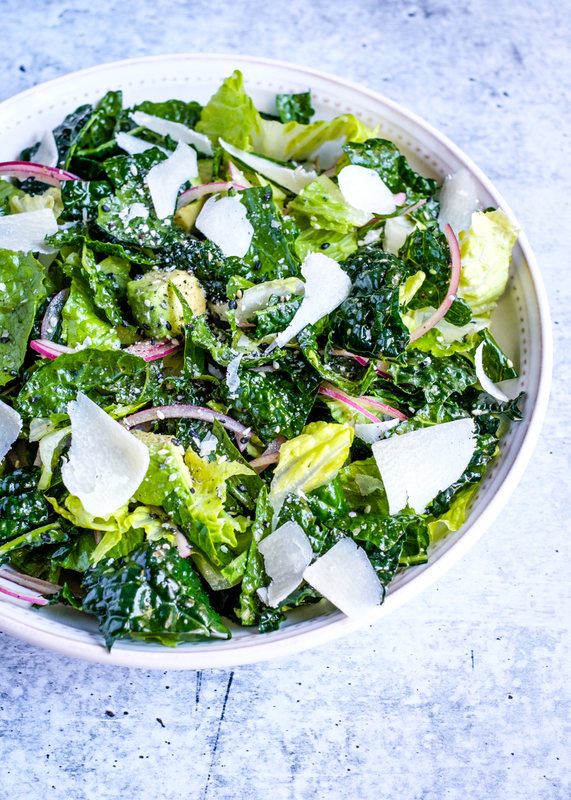 There is something about the combination of kale – more specifically Lacinato or dino kale – and romaine lettuce. 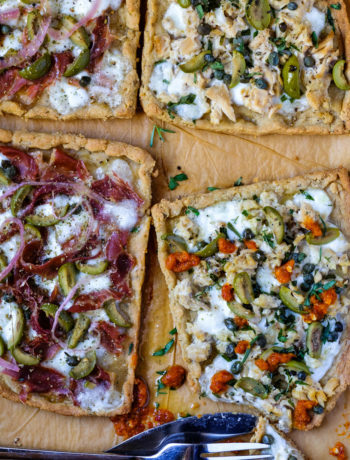 They balance each other perfectly and create a salad that is satisfying even as a main dish. And the sesame salt is absolute perfection – a trick I just learned recently from Bon Apetit magazine. 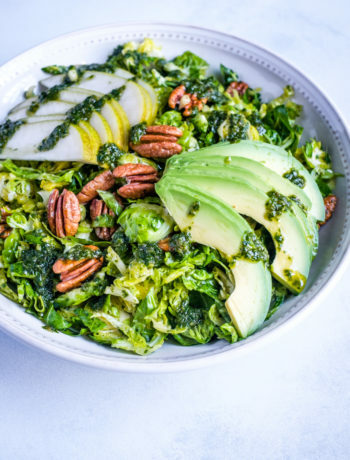 The inspiration for this kale-romaine salad comes from a similar one I usually order in one of my favorite cafes in Dallas, Ascension Cafe. They have a kale-romaine salad on the menu, which I have to modify slightly and remove some of the ingredients to make it plant paradox compliant, but I was always surprised by how satisfying this salad was even with so little ingredients (I even remove the dressing and just add extra virgin olive oil). Kale salad alone can be a little tough and bitter and romaine salad alone is kind of boring and more of a side dish. But together the balance each other, the crispiness and sweetness of the romaine complements the bitterness and tougher texture of kale. It just works. I wanted to try to recreate this at home, giving it more flavor with compliant adds-on (the original one has sunflower seeds, raisins and an apple vinaigrette which I ask to not be added). Since I wanted to add some seeds, I thought sesame seeds will fit well but then I discovered this amazing idea in the latest issue of Bon Apetit magazine: sesame salt. I tried and oh my, what an amazing trick to add flavor to salads! How to make the sesame salt: toast about 3 tbsps of sesame seeds until fragrant, about 5 minutes, on the stove, in a naked pan. I used a stainless steel All-Clad sauce pan. I mixed black and white sesame seeds, but you can use any raw sesame seeds you have. Watch them and stir them, making sure they don’t burn. Once ready add them to a mortar and pestle and let them cool down. Add one heaping tsp of flaky sea salt – I used Maldon Sea Salt Flakes – and slightly mash until about half of the sesame seeds are ground. This makes more than you need for the recipe, store the leftovers for about one week in an air tight jar and use with other foods. For the salad you need about 1 heaping cup of clean, dry chopped kale and romaine (one of each). Measure by pressing down or just add more – in my opinion there is never too much kale or romaine in a recipe. The balance between the two is important here. I used one heaping cup or two light ones of each and had it as a main dish for lunch, and it was the perfect size. You also need about 1/4 of one small to medium red onion, finely julienned, depending on how much you like raw onion in your food. 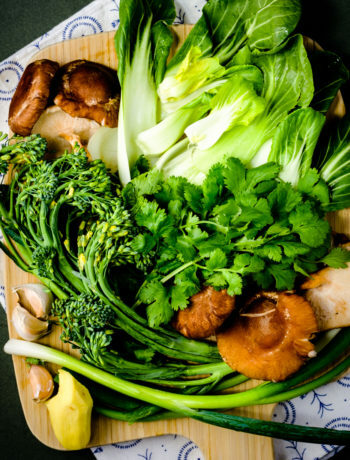 You will marinate this for 5 minutes in a mix of vinegars, this way some of the strength will be gone. For the vinegar mix, I used 1 tsp champagne vinegar, 1 tsp apple cider vinegar and about 1/4 tsp balsamic vinegar. Slice your onion, add it to a small bowl with the mix of vinegars and let it sit in the vinegar while you prepare the salad. I use Kasandrinos oils and vinegars. And Bragg apple cider vinegar. 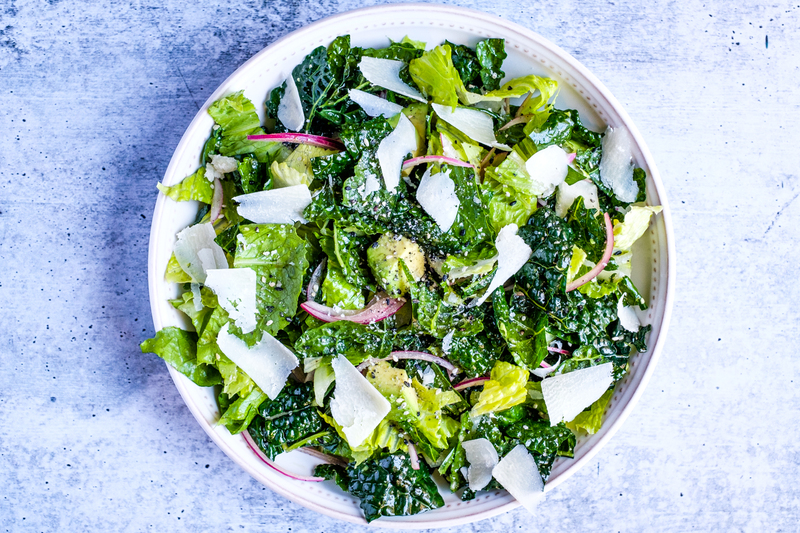 The other only three ingredients for this salad are: extra virgin olive oil (of course), half avocado and few shavings of Parmigiano Reggiano. This salad is ready in no time if you have your kale and romaine washed and dried in advance. This is one of the most helpful meal preps I do, and saves me a ton of time. If you feel this is not enough, or for hungrier people like my husband, you can always add one or two boiled eggs or cooked chicken. Or just have it as a side dish or appetizer. And friends, don’t forget to chew, especially the kale, digestion starts in the mouth and some of the benefits of kale start with braking the leaves while chewing. Easy, healthy and super satisfying salad. 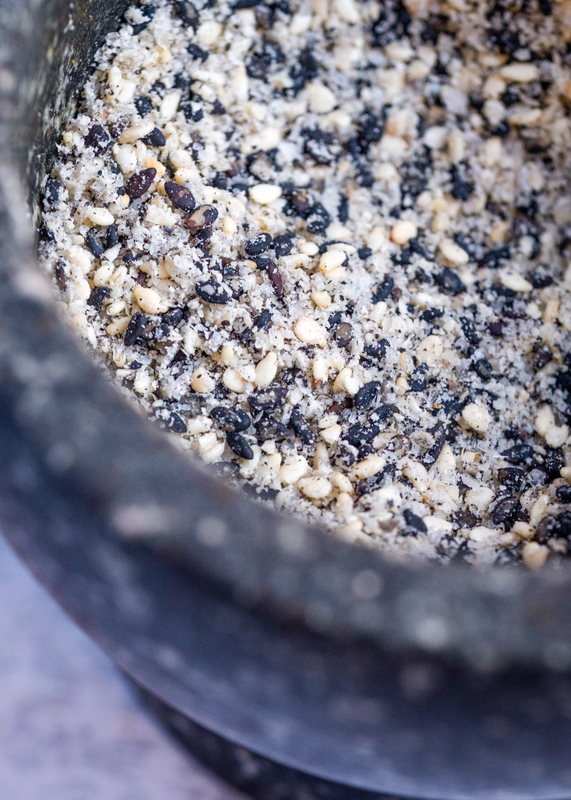 Make the sesame salt as per the instructions in the post above and use it for this recipe and next meals (toast the sesame seeds and mix in a mortar and pestle with the salt). Make the vinegar mix and add the sliced onions. Mix and let it sit until the salad is ready. Add the kale to a mixing bowl, add 1 tsp of sesame salt, half of the extra virgin olive oil and massage gently with your hands to break down some of the fiber in the kale. Add the romaine lettuce, half cubed avocado and the onions and vinegar and gently mix everything with your hands. Add the salad to a serving plate, sprinkle some more sesame salt on top, and drizzle the rest of the olive oil. Serve immediatly. You can add some boiled eggs or chicken to this salad. And don't forget to chew, especially the kale, digestion starts in the mouth and some of the benefits of kale starts with braking the leaves while chewing. I have to try this! Especially the sesame salt- never heard of it before. All of it sounds absolutely delicious!